The regular season is over, and for 20 of the league’s 32 games, it’s on to 2019. For 12 of the remaining teams, it’s on to the playoffs, where unlike recent seasons there aren’t any easy outs. This week’s slate includes zero touchdown favorites and three games where the line is less than three points. Will we see all four road teams win (as we did in 2015), all of the favorites cover (2016), all of the dogs cover (2017), or something in between? Time to soldier on! Check back to profootballfocus.com for college spread picks using this model (as well as other information) and check out PFF Greenline for our NFL version of the product. The odds-on favorite to win the Super Bowl at this moment, the Saints are enjoying the fruits of their labor this season with a first-round bye – waiting for an eventual date with either the Cowboys, Seahawks or Eagles in round two. 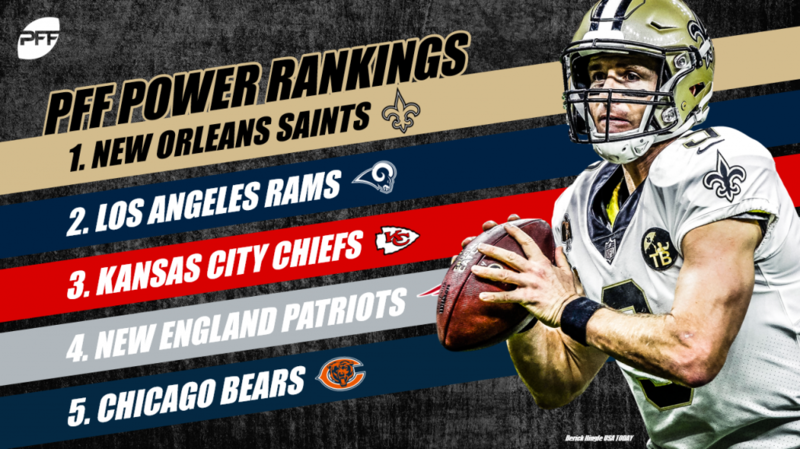 Drew Brees finished the year second in our WAR metric, and first in quarterback grades, a truly brilliant season that could end with his second career title. The Rams somewhat limped to the finish in 2018, with Jared Goff earning just a 56.3 overall grade since the Lions game (34th among quarterbacks), and Todd Gurley was unable to compete in either week 16 or 17 with an injury. They are easily the second-most-likely team to represent the NFC in Atlanta, but we would not be surprised to see them upset in their first game (as they were a season ago), either. What a season for the Chiefs. Andy Reid was a top coach in our coaching metric, Patrick Mahomes is the MVP, and more than their fair share of players (even a defensive one) made our All-Pro Team. Despite some late-season blips, the Chiefs’ defense has been better at home this season than on the road, and that trend bodes well for them as they try to turn around their 2-6 all-time Arrowhead record in the playoffs. The Patriots are very much like the Rams here – a team with a great coach, inconsistent defense and a limp into the playoffs. Under 7% of Tom Brady’s dropbacks in 2016 were negatively-graded, easily the best in the league, and only 12.1% last season were. This season, that number is 13.1%, and he simply hasn’t looked himself for much of the year. 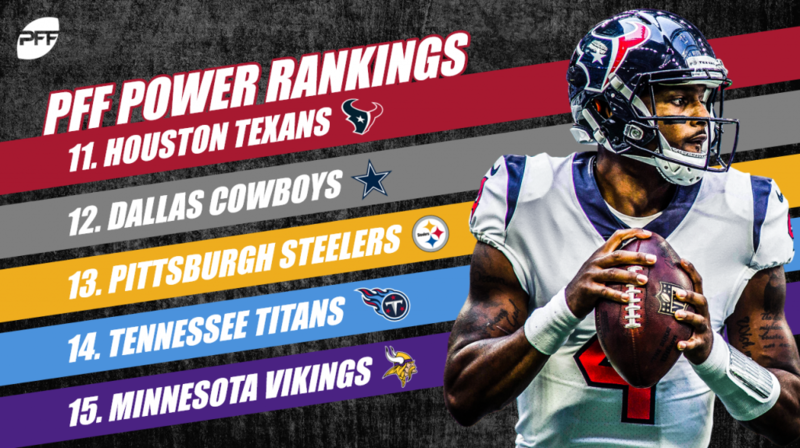 If they get in a matchup in round two with Deshaun Watson and the Texans, there’s a case to be made that he would be the weaker quarterback in such a matchup, putting an interesting twist on the 2018 AFC playoffs. The Bears played their starters against the Vikings on Sunday and won convincingly, putting their division rival out of the playoffs for the second time in three years and punching their own ticket for the first time since 2010. Their defense is easily the best in the league, allowing -0.11 EPA per early-down passing play in a league where less than 25% of the league is allowing even 0.0 or better in that realm. If Mitchell Trubisky can continue to improve, look out. 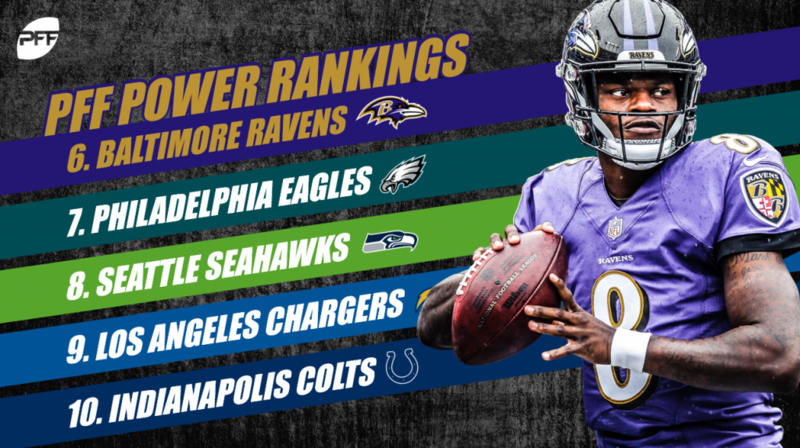 Another team that’s winning with defense, the Ravens are first in the league in early-down success rate allowed in the passing game (45%) and are allowing less than a 35% success rate on early-down runs as well. Lamar Jackson will continue to be a question mark – elusive enough to break 20 tackles as a runner this season while being careless enough to fumble 10 times in that spot as well. Baltimore is a team we think no one wants to play, but most wouldn’t bet on to win the Super Bowl, either. The Eagles are surging behind Nick Foles and his 80.4 grade (sixth-highest in the NFL) over the past three weeks. He’s beaten two teams with a winning record (the Rams and the Texans) while taking care of business before being hurt against a Washington defense that is not a bad overall unit. The spread on their game with the Bears (six-ish points) is the highest of the weekend, but very much like Atlanta (+6ish) against the Rams last season, I like the proven team against the upstart more times than not in round one. The Seahawks have been rewarded a lot this season for bad behavior. More than any other team in the league, the Seahawks have made the negative expected value play on second down, but have not paid for it nearly as much as an average team due to Russell Wilson’s NFL-best big-time throw rate. They face a Dallas team this weekend that is equally inefficient in its approach but not nearly as endowed at the quarterback position, which is why we like Seattle in that spot. It took the Chargers a while, but they did get their 12th win Sunday against the Broncos, marking their best season since 2009 (and only their second playoff appearance during that time). Unlike their disappointing 2006 and 2009 teams, this Philip Rivers squad has (likely) all road games ahead of them for a possible Super Bowl bid, and like 2007, 2008 and 2013 (where they won at least one playoff game) I think many are picking them to thrive in such a role. Rivers’ top-five WAR is something we wouldn’t sleep on this January. The Colts were a team we touted at many times this season, and even after their 1-5 start. In a great combination of quarterback play and coaching on the offensive and defensive side of the ball, the Colts have gone from a team that many thought was poorly run to the model for how teams like the 49ers should approach their offseasons moving forward. Twenty-eight percent of Andrew Luck’s throws this season were positively graded, while under 13 percent were negatively graded, numbers we’ll likely see continue to diverge as he gets more comfortable with Frank Reich’s scheme moving forward. Houston is only 1.5-point favorites at home against the Colts this weekend, lending some credibility to the fact that we’ve rated Indianapolis ahead of Houston down the stretch of the season. Deshaun Watson has faced the highest pressure rates of any quarterback this season, but no quarterback has been better when pressured, likely due to the most-valuable non-quarterback in the league this season in DeAndre Hopkins (115 catches, zero drops). The Cowboys won the NFC East despite starting the season 3-5 and having a quarterback in Dak Prescott that is generating big-time throws on less than 4% of his passes this season (the last throw against the Giants in week 17 notwithstanding). They did it with a defense that, while struggling a bit down the stretch, had a torrid middle of the season led by defensive rookie of the year candidate Leighton Vander Esch and second-year standout Jaylon Smith – the new wave of NFL linebackers.